Frame Alloy7005 T6, liquid coating (frame protection-plate, black anodized). Footboard Alloy 7005 T6, black anodized. F-fork RST CAPA T6, travel 3�?, black. Headset 1 1/8�? ahead, Black anodized. Stem Footbike, alloy 1 1/8�? ahead, angle adjustable (-17 degrees – + 50 degrees), extension 120 mm, black anodized. Bar-ends	Alloy, long type, black anodized. Rim front	JetSet, double wall, black, 26�? 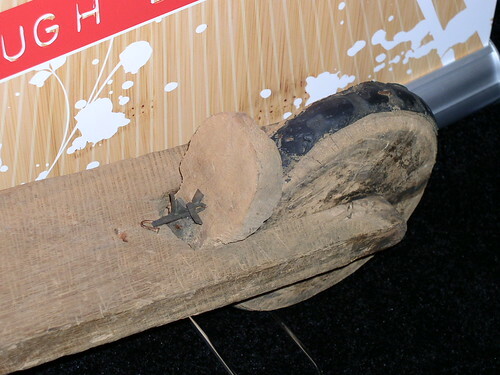 (559), 32H. Rim rear JetSet, double wall, black, 18�? (355), 28H. Hub front	Footbike, alloy, black anodized, sealed bearing, 100 mm. Hub rear Footbike, alloy, black anodized, sealed bearing, 65 mm. Tire front	26�? x 1.95, semi-slick, black. Tire Rear 18�? x 1.75, black. Brakes front: disc-brake Avid BB5, rear: V-brake, Avid 5. Rear-mudguard Plastic, black, SS nuts + bolts, double brackets. 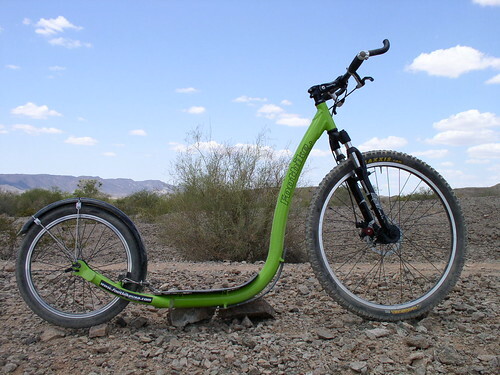 The Footbike Trail is definitely one of the most interesting products that I’ve have privilege to test. I’ve been riding the Footbike Trail for a few months. I’ve taken it both on and off road. INTENSE WORKOUT!!! 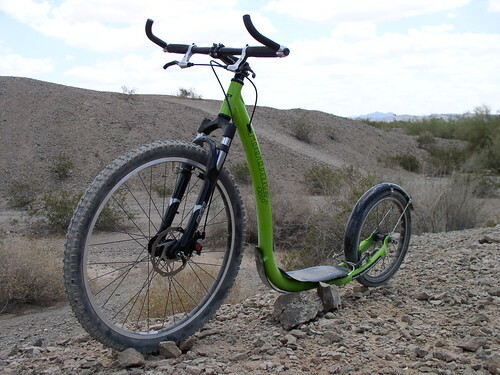 It doesn’t take long to find out that a Footbike would give you a great workout especially when you take it out on a trail. You’ll have to run, push, carry, and kick your way up a hill. But the pay off on the down hill side is awesome! Going down a steep hill on a mountain bike is always fun. 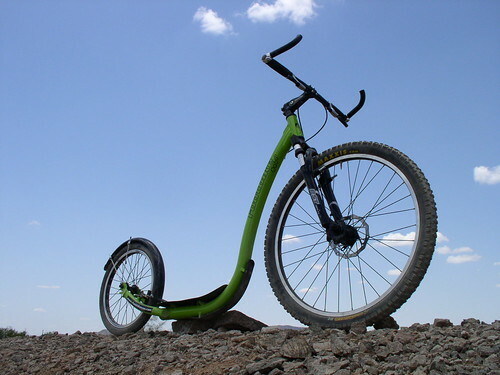 But taking the same hill on the Footbike Trail is such a blast! I had my nephew shoot a short video of me riding the Footbike Trail down a hill. One thing I didn’t like about the Footbike Trail was the clearance or lack of. 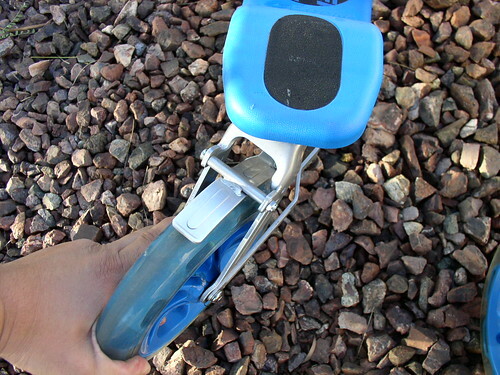 Without any weight on the Footbike, you only get 2 inches of clearance from the ground to the protection plate. Add my “phat�? 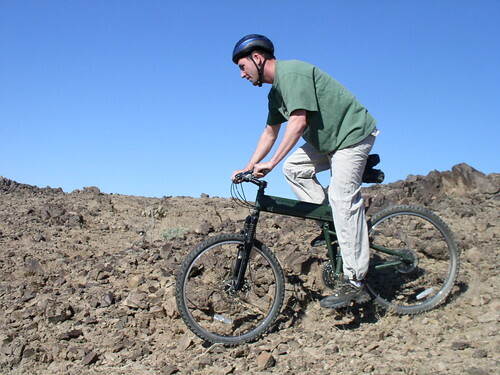 arse on it, the give of the fork, and any slope or rocks on the ground takes away any clearance you had. Each time it bottomed out, threw my balance quite a bit. Testing the Footbike Trail has definitely been interesting. Riding it was always fun. Having it’s unique design turns quite a few heads. And the workout you get is unbelievable. 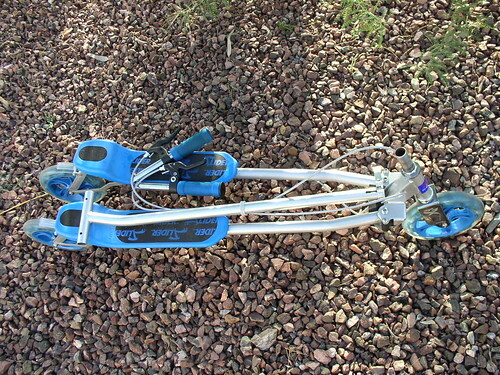 For more information about any of the Footbike products check out FootbikeUSA. Just like any other ride, we started out slow making sure we didn’t get too aggressive. But as our egos got bigger, the down hills we rode and rocks we ran over got bigger as well. Eric decided to try out some acrobatic tricks he saw on MTV’s Scarred. 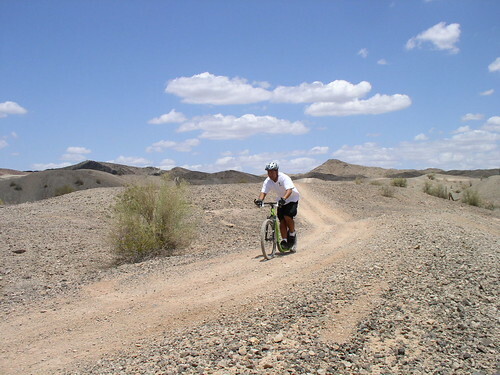 He flew over the handle bars, flipped the bike over, and ended up planting his hands in desert rocks. Man, I wish I had video of that. Check out that skid mark! He had chunks of meat flapping on his hands. It looked pretty bad. He wouldn’t let me take a picture of his hands because he knew I’d make fun of him. I guess he should have worn the girly gloves I offered. Unfortunately, I can’t say the bike was ok. Somehow the back rim got bent but worse could have happened. After the ride he told me that he wants to go out again. But would have to wait until he heals. I’m willing to bet he’ll have gloves the next time. 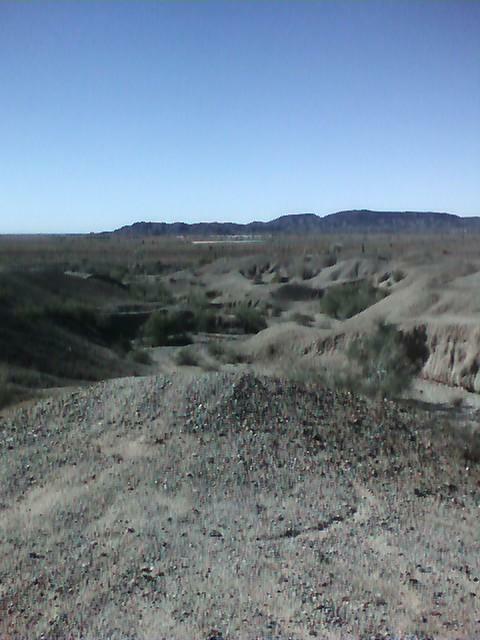 Earlier this morning my buddy Eric and I headed out for some mountain bike action just outside Yuma Proving Grounds. It seemed like the trail was used mostly by four wheelers. It was a tough ride. There were tons of hills and loose gravel at every turn. The batteries on my camera died so I had to use my cell to take pictures. So just bear with me on the quality of the shots. Here is a view of what we just rode through. Going up the hills wasn’t too much fun. 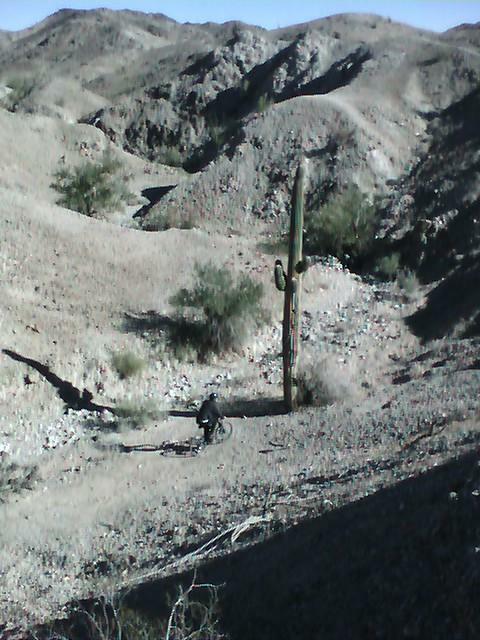 At times it was a bit too steep or the dirt was too loose that we had to walk the bikes up. But the pay off on the other side was awesome. It was an instant adrenaline rush. I definitely had to be on my “A�? game when riding down these hills. 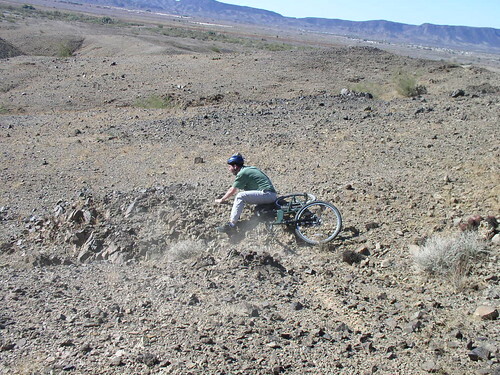 Flying over my handlebars and sliding down these jagged rocks just isn’t what I would call fun. You could ride up and down these hills as far as the eye can see and each turn you make is a different experience. But I have to warn you, not to ride towards the Proving Grounds. 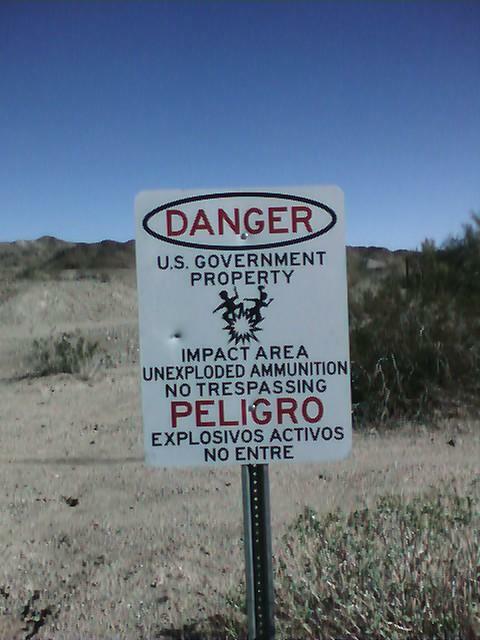 Signs like this are posted all around YPG for a reason. After Christmas, some friends and I plan to hit the hills again. I’m curious to see how many actually shows up for the ride. Designed to propel you forward without your feet touching the ground. 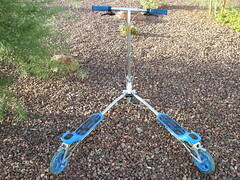 Pivoting polyurethane wheels provide the most maneuverability, yet is more stable than 2-wheel scooters. 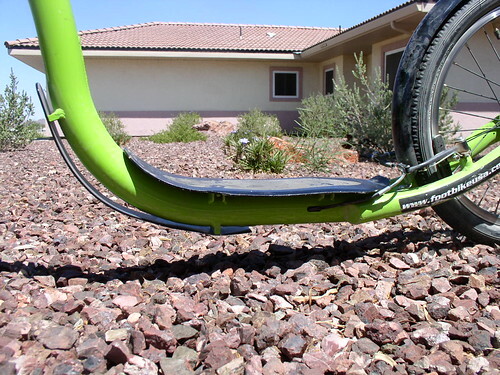 During Interbike 07 we got a chance to chit chat with the cool people from Slider. They gave us a demo of how their product worked and even gave us the opportunity to test it out for them. The Slider is definitely one interesting piece of machinery. 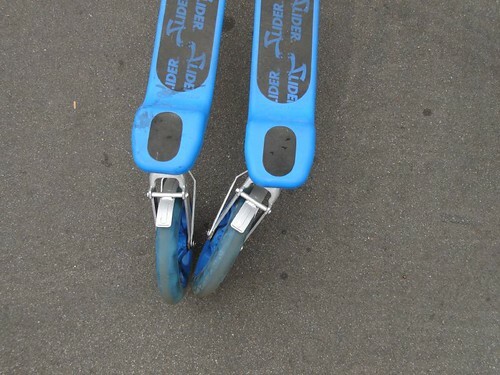 There are several things you could do propel yourself without having to touch the ground. I found a scissors action with my legs to be the easiest way to make it go. Simply push both your feet out then retract. It’s drive springs and pivoting wheels seen above would do the rest. The Slider’s action deck combined with the back wheels ability to pivot 45 degrees gives you stability and awesome maneuverability. It’s stable enough that I could turn 180 degrees when riding at full speed. You just have to lean into the turn and counter steer the front wheel. Strengths: Such a super fun ride! It only takes a few minutes of riding before you‘re thinking of tricks to do. It’s affordable. MSRP for this particular model is $129.99. 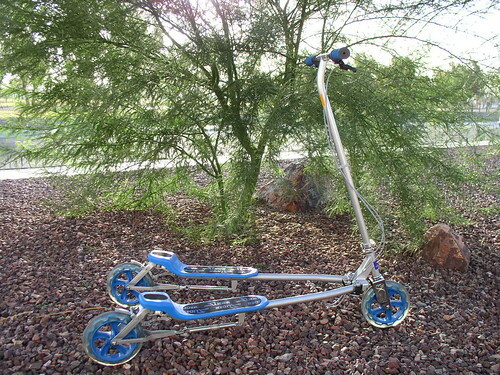 Trikke one it’s competitor is asking $369.99 for a similar item. 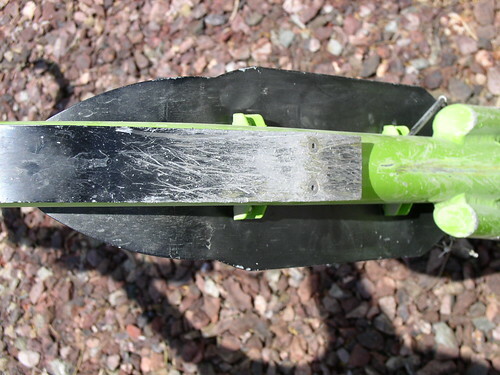 Weakness: During the test period, a weld on the right action deck broke causing it’s rear wheels to be uneven. I noticed it after my brother RL and I were riding it around his neighborhood. I spoke with George Tarrab one of the Slider’s representatives about the problem. He told me that it might have just been a fluke on this particular Slider. He then assured me that their 6 month warranty would cover any type of problems a customer would have with their Slider. 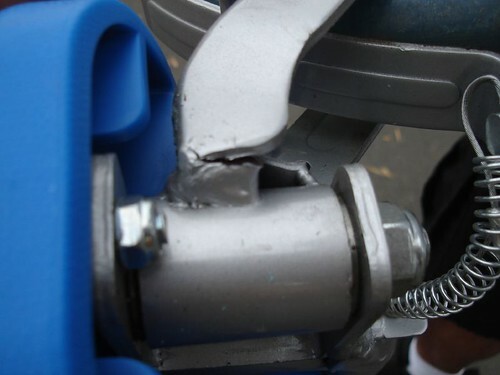 “We will of course warranty the unit by providing new rear caster assemblies with upgraded bearings, but will also include a new set of wheels to freshen the unit up for the customer’s trouble…�? said Mr. Tarrab. It’s good to hear a representative of a company stand behind their product. Summary: The Slider is definitely a fun ride! 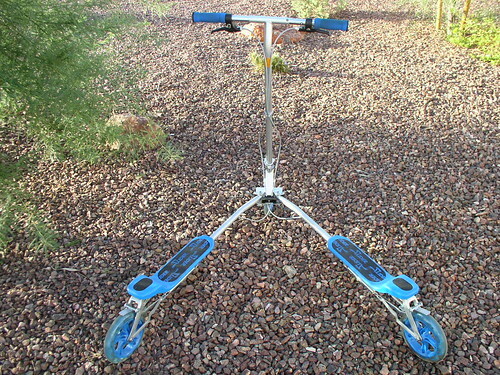 Everyone who jumps on this bad boy instantly falls in love with it. It only takes a few minutes to get used to before you’re out there riding it like a pro. 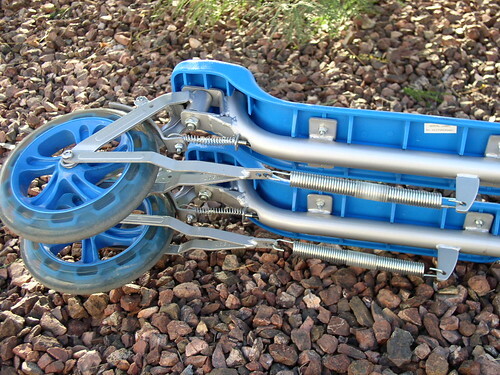 This is a must have piece of equipment. I actually plan on ordering one of the smaller models for my daughter. 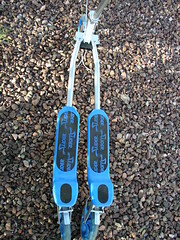 For more info check out the SLIDER the UnScooter site. This past weekend, I took my family out camping. We camped out by Mitry Lake just outside Yuma, Arizona. We got to do some fishing, roasted some marsh mallows, and even got to do a bit of off road action on the KMX Kart. We had so much fun that we plan on camping again this upcoming long weekend. But this time around, I’ll have to bring a couple of mountain bikes instead of the KMX. I saw some sick looking trails that’s just begging to be ridden. I was walking around the local Wally World with the familia last night and something caught my eye. I had to take a picture of it to share with you guys. The picture doesnâ€™t do it justice. I took the shot with my cell. But man, did those tires look Sweet! They were the Sweetskinz Rattleback tires mounted on a Razor Street Style bike. If it werenâ€™t for the tires, I probably would not have noticed the bike at all. 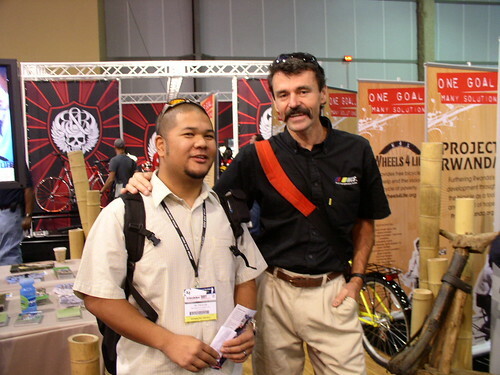 During Interbike RL had an encounter with his new man crush Tom Ritchey and chit chatted about Project Rwanda. Project Rwanda is committed to furthering the economic development of Rwanda through initiatives based on the bicycle as a tool and symbol of hope. Our goal is use the bike to help boost the Rwandan economy as well as re-brand Rwanda as a beautiful and safe place to do business and visit freely. 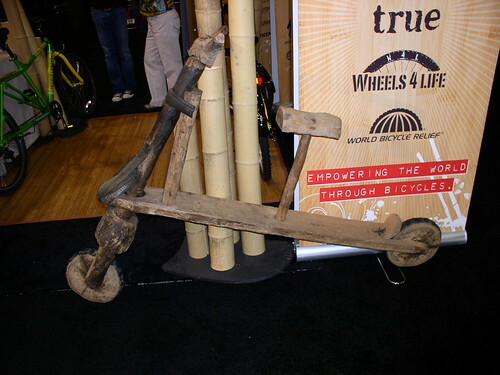 Above is a shot of a bike that was used by coffee farmers in Rwanda as their main mode of transportation and utility. 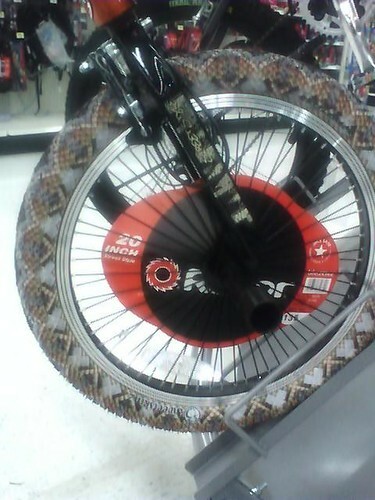 This bike doesnâ€™t have suspensions or a customized paint job, but it does have high quality brakes. To help solve Rwanda’s transportation problem, the Coffee Bike Project aims to make specially designed load-bearing bikes available to farmers for a reasonable price on credit and where quality premiums would cover the bikeâ€™s cost. These bikes are sold to the coffee farmers for 70,000francs, about $120 US Dollars. Why $120 you ask?! 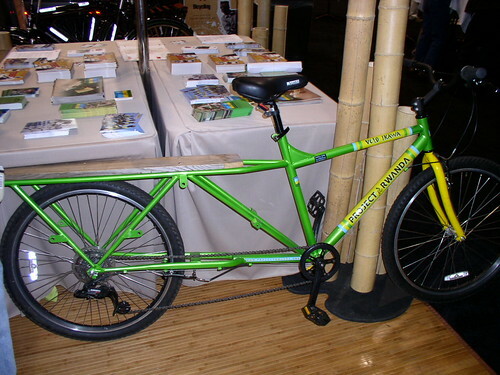 $100 would be the cost to make these bikes and the other $20 is for shipping costs. A bit on the pricey side for a Rwanda coffee farmer but would definitely benefit them in the end. Learn more about PROJECT RWANDA. The guys from the UnScooter were at Interbike and hooked us up with one of their Sliders to test out. Iâ€™ve been riding the Slider around the neighborhood since I got back from Vegas. And every time I do, someone always asks if they could try riding it. It only takes a couple of minutes for someone to get used to the pivoting action the Slider gives you. 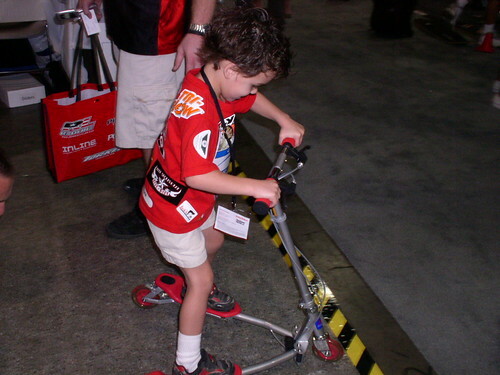 Pictured above is a shot taken at Interbike of a 4 year old kid who jumped on a Slider and only took a minute to get going pretty well. Stay tuned for a further detailed review. 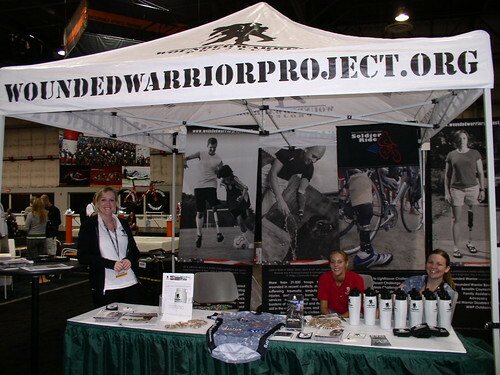 The most interesting group I saw at Interbike was the Wounded Warrior Project booth. Being an active duty soldier these guys hit me closer to home. I met a few of the volunteers and got a bunch of great information about this nonprofit organization. Itâ€™s great seeing people like this helping our wounded heroes. 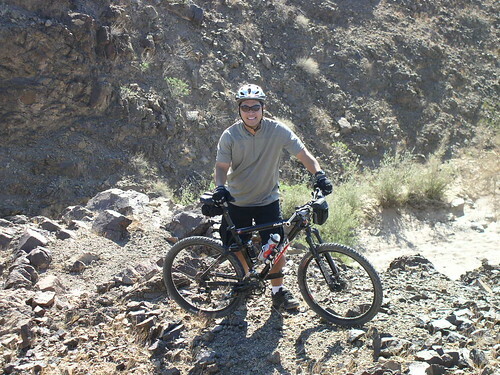 The Wounded Warrior Project Soldier Rideâ€™s cycling programs give severely wounded servicemen and women the opportunity to reinvigorate their bodies and uplift their spirits. Soldier Ride provides each of the brave men and women who participate in our ride with the adaptive equipment they need to cycle, even if they are missing one or more limbs. 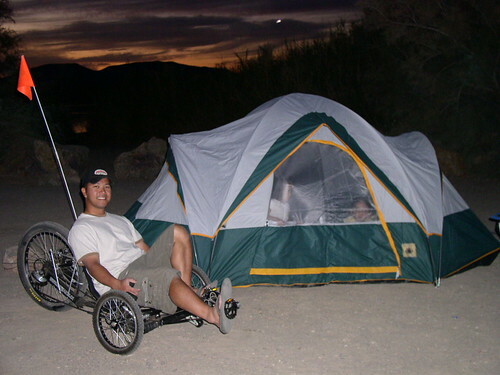 Participation in our cycling and recreational events fosters the rehabilitation of the wounded by showing them that they can still lead active, independent lives and gives families the opportunity to reconnect outside of the hospital environment. Interbike was such a blast! There were literally thousands of different products that various vendors were showing off. 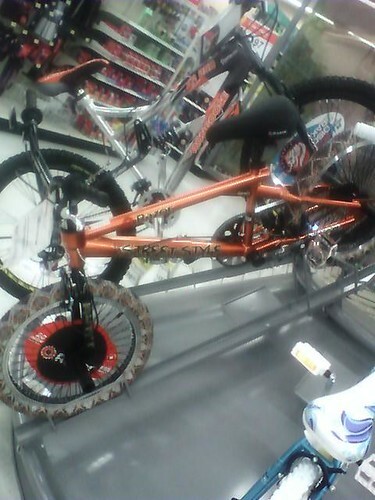 You could find anything from the hottest mountain bike to the latest and greatest energy drink! But one product is still stuck on my mind. 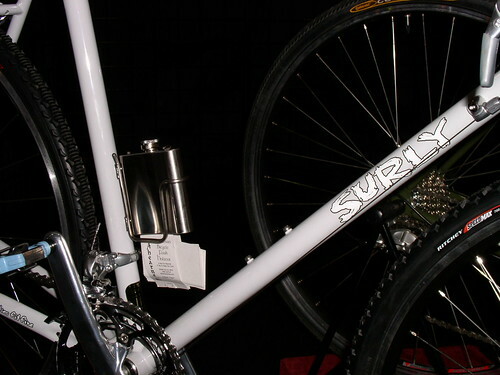 And thatâ€™s the Aherne Cycleâ€™s Spaceman Flask Holster. This bad boy is officially going to the top of my Christmas list for Santa.